Social listening sounds like a term coined to describe those friends who, when you’ve fallen on hard times or otherwise need a friendly ear, pull up a pew and graciously listen to your woes. What it really describes, of course, is the process of monitoring and extracting insights from social conversations which business owners then use to inform their overall strategy. By keeping tabs on conversations that touch on specific keywords and topics relevant to your business and industry, you can ensure the content you produce hits your audience between the eyes (in a good way). Social listening is also an invaluable means of sourcing high-profile influencers, performing market research, gauging interest and sales opportunities, reinforcing brand values, tracking the health of your business and improving customer satisfaction. Few modern digital tools influence strategic business decisions quite like social listening. Speaking of influence, the pervasive influence of social media on society at large continues to grow. According to Brandwatch, there are over 3 billion active social media users, with the average daily time spent on social totaling nearly two hours. Retail brands, reflecting the habits of these tweet-obsessed consumers, have migrated to the social sphere en masse, with 91% of retail companies now using two or more social channels and 81% of small and medium businesses active on some kind of platform. As a business owner, why wouldn’t you want to exploit that market to the fullest? 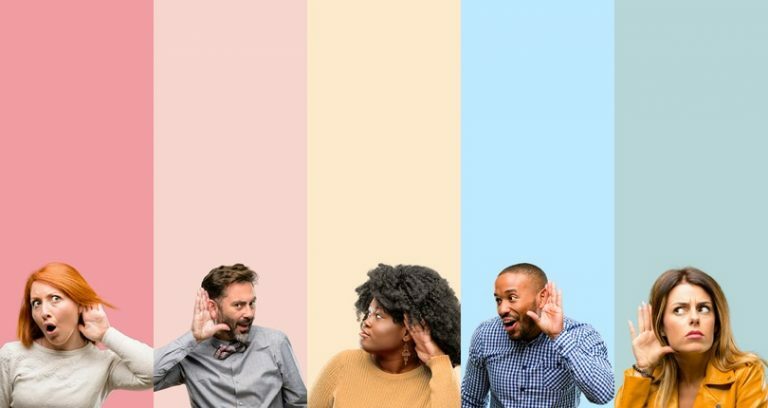 Therein lies the appeal of social listening: monitoring and responding to conversations occurring in your space allows you to harness the power of social media to significantly grow or build your profile. If you’re interested in leveraging social listening to grow your business, you’ll first need to find an effective tool. In this blog article, we’ll tell you about four of the very best listening tools you absolutely must consider. With plans starting at just $29/month, Awario is an affordable, Enterprise-level web monitoring platform that promises to get you up and running in no time. One of the many great things about Awario is that it offers a free Leads module as an add-on for all plans. Leads is a particularly clever feature, in that it lets you describe your product and specify competitors before creating a ‘mention monitoring alert’, a very useful tool for social selling. To harvest leads, the tool combines your product descriptions and competitors’ brand names with predictive insights to find prospective clients who are requesting advice about a product or service you offer; it also flags up consumers who are complaining about one of your competitors, offering scope to essentially swoop in and solve their problem. Of course, it pays to fine-tune your Lead settings to ensure you’re being fed the kind of results you want. But when you’ve cracked it, you can start interacting with prospects in real time, either by responding to public posts or jumping on to their social profile and pinging them a DM. The tool even flags up plagiarized copies of your content and locates link-less brand mentions that you can then look to convert. While many social listening apps rely on a lone third-party data provider, Awario crawls more than 13 billion web pages every day, in addition to APIs. Needless to say, it’s a great option for those seeking to grow awareness of their brand. Keen to trigger word-of-mouth marketing, compile vast amounts of consumer intelligence and generate hot new leads with pinpoint precision? Then Brandwatch is for you. A highly powerful, analytics-driven listening tool beloved by some of the world’s most successful agencies and brands, it costs a pretty penny – the most affordable Pro plan costs $800/month, and for this, you get access to 10,000 monthly mentions and 30 days of historical data. That might deter some budget-constrained business owners, but take my word for it – the tool is worth every cent. Among its inventory of innovative features, Brandwatch specializes in image recognition so you can find images containing your brand logo; as well as demographic data so you can learn more about your audience (gender, interests, location, and profession; also who they follow and interact with). It also identifies trending topics in your specialty, offers API access and provides useful dashboards that can be exported into customizable PowerPoints, perfect for internal reporting on social engagement. 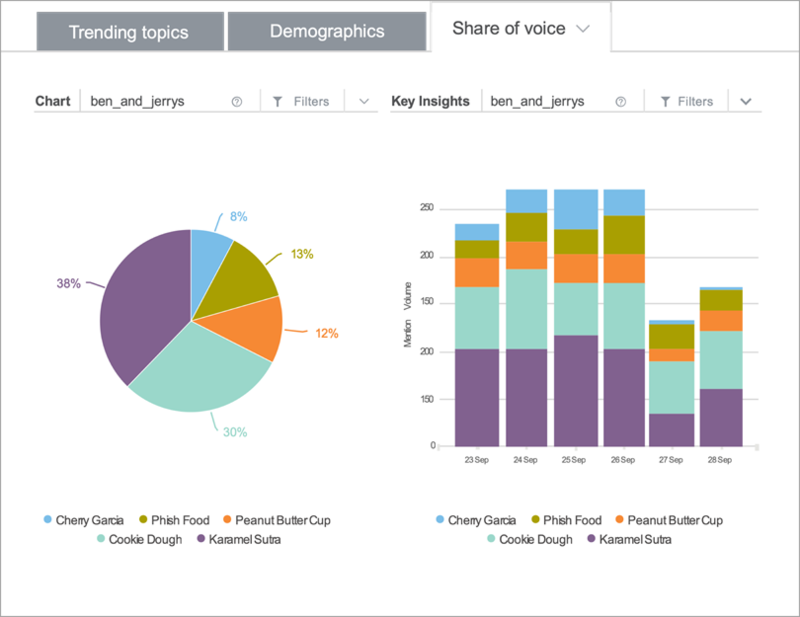 Brandwatch even boasts an advanced data visualization platform named Vizia. This helps you scan and better appreciate your Brandwatch data, and combines this with key insights from various integrations including Google Analytics and Hootsuite. Whether you’re knee deep in market research, assessing the efficacy of your most recent marketing campaign or just interested in learning more about who your customers (or prospective customers) are and what they want, Brandwatch is a forward-thinking software solution. Mention gives you up-to-the-minute updates about your brand from the people who determine your success or failure – your customers. All you need to do is type in your relevant keywords and set up alerts. Armed with the information the algorithm yields, you can fully focus on driving brand awareness, elevating your reputation and nurturing profitable relationships across all key channels, from Instagram and Facebook to Twitter and LinkedIn. 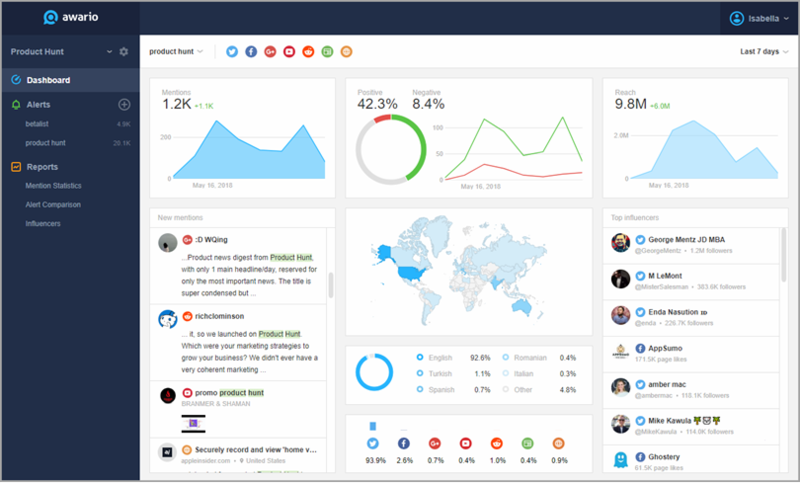 As with Brandwatch, custom reports, and easy-to-read, real-time analytics dashboards inform you about what’s working and what isn’t, while also supplying valuable market research tailored just to you. The dashboard might seem a tad overwhelming at first glance, but it’s surprisingly easy to come to grips with – you’ll be tracking engagement rate, reach and impressions in ten minutes. What’s more, businesses can take advantage of sentiment analysis, competitor monitoring and a related topic tool. One area where Mention excels is with its inbuilt influencer rating tool, which highlights the most trusted voices in your sphere so you know exactly who to contact. Not everyone is sold on influencers, but get the right advocate touting your business and it could help drive brand awareness, establish trust and bring you closer to a new audience. According to a survey by Collective Bias, 70% of millennials are swayed by their peers when contemplating a purchase. The same survey also found that 30% of consumers are more likely to purchase a product if it is endorsed by a non-celebrity influencer. Mention offers three plans: Solo ($29/month), Starter ($99/month) and Custom (get in touch for a quote) and you can get 12 months for the price of 10 by taking out an annual subscription. Last but not least is Keyhole, an ingenious, easily navigatable tool which promises to ‘simplify social media and online monitoring.’ To be fair, it does just that, providing you with all the info you need to launch campaigns, foster long-term relationships and gradually take your brand to the next level. With clients such as Google, Mashable and Spotify, you might expect Keyhole to make you pay through the nose; however, so convinced are they that you’ll sign up after checking them out, they offer everyone a free 7-day trial. Their service is broadly similar to the others, in that they offer brand, event and campaign monitoring, market research, API access, advanced sentiment analysis, and influencer marketing. Where they differ somewhat is with the number of different plans available to suit your needs and budget: five in total, including Professional ($149/month), Team ($262/month), Corporate ($449/month), Agency ($749/month) and Enterprise (custom pricing). Rather on the expensive side, but again, you can sign up for a free trial to get the ball rolling. You can also make a 25% saving by buying a year right off the bat. One thing that’s very cool about Keyhole is that its analytics dashboard features a suggestive word cloud (think useful suggestive, not naughty suggestive!) – all the better for pinpointing hashtags typically used with your main hashtag. You can also discover popular hashtags appropriate to your campaign and sniff out lucrative areas of opportunity. Speaking of hashtags, Keyhole CEO Saif Ajani claims that the platform is ‘the #1 company in the world for Hashtag Analytics.’ Half an hour of using the keyword and hashtag tracker is enough to make you a believer. With more and more brands tapping into the buzzing hive of social media to glean insights about their target markets, no-one wants to be left behind. While you may have some ethical concerns about essentially ‘snooping’ on people’s social accounts, it’s becoming imperative to obtain the kind of authentic, unbiased insights that your competitors have been accruing for a while now. Whichever listening tool you choose, have a plan in place for what you’re going to do with the data when you get it. Then the sky’s the limit. Guest author: Lilach Bullock is highly regarded on the world speaker circuit, Lilach has graced Forbes and Number 10 Downing Street. She’s a hugely connected and highly influential entrepreneur. Listed in Forbes as one of the top 20 women social media power influencers and was crowned the Social Influencer of Europe by Oracle. She is listed as the number one Influencer in the UK by Career Experts and is a recipient of a Global Women Champions Award for her outstanding contribution and leadership in business. Check out her site Lilach Bullock or connect with her on LinkedIn.